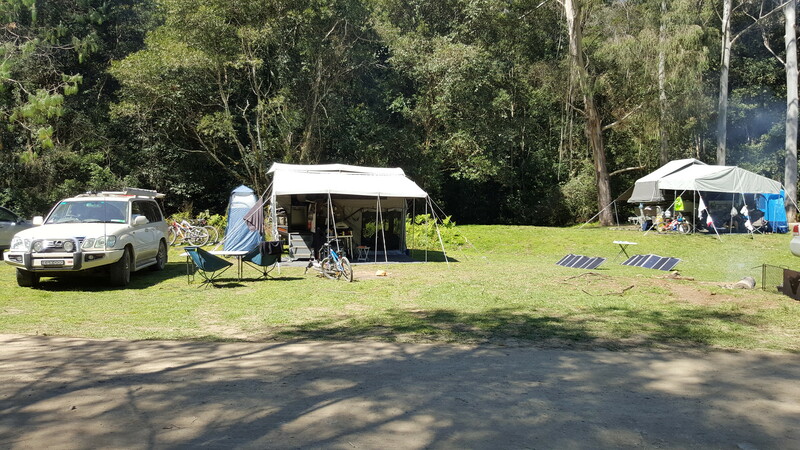 We had originally planned to head away somewhere at the beginning of the school holidays, after not spending any time away camping since the end of our last trip in April. Turned out that wasn’t to be as Rach needed to make a trip back to NZ for the (not) funeral of her Nanna. That left me and the kids to get everything ready to head away so that we could pick her up from the airport on Wednesday afternoon – Ultimate in tow – and keep on trucking to our destination. 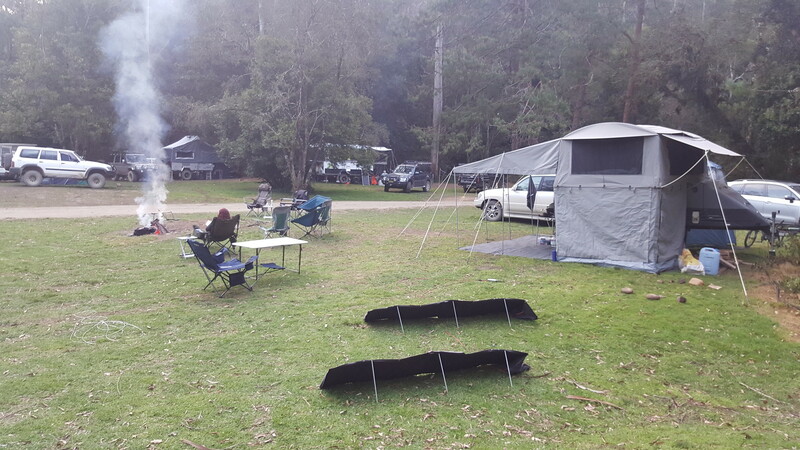 Speaking of destination, deciding on the place to camp took some debate and weather gazing before we settled on Coachwood Camping Area on the Telegherry River. Our original plan was to head to Sofala, and camp where we had 5 years before, on the banks of the Turon River. 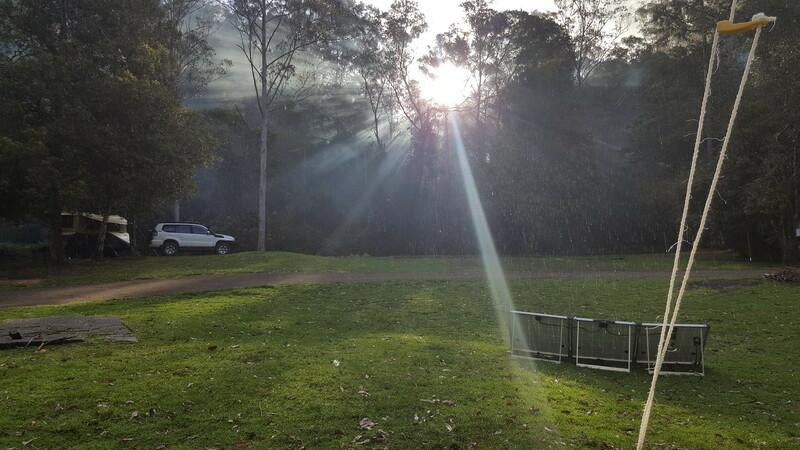 However, leading up to our departure, in a similar (but reversed) sequence of events that led us to Sofala last time, the weather forced us north. While the potential for snow only a very short drive away had some appeal, the rest of the forecast of torrential rain and gale force winds was too much to overcome. Our camper – kids had their swags in the underneath room this trip. Travelling again with Trent, Leanne and their boys, we agreed on Coachwood. We were to head up on Wednesday and pick a spot, and they would drive up on Thursday morning and meet us there. The drive north was pretty easy once we had navigated the Pacific Highway through Chatswood and Wahroonga onto the M1. 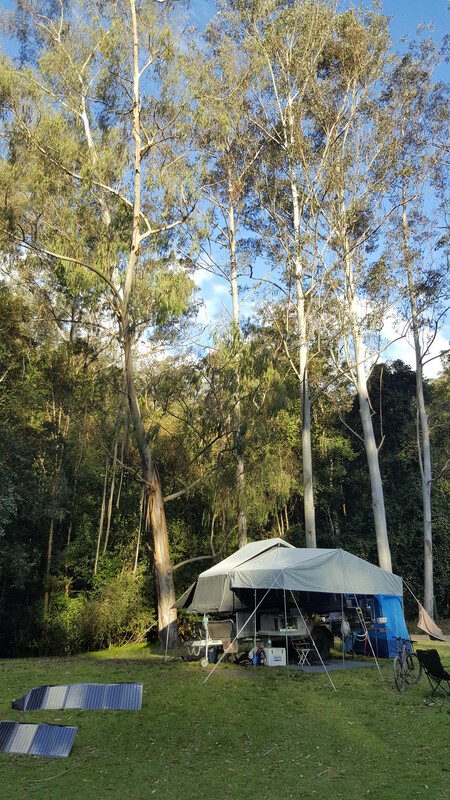 We pulled into the Frying Pan Creek campsite on the other side of the river and asked for some directions to get over to the Coachwood side – particularly keen to camp there as we could see another Ultimate there, but it wasn’t immediately obvious how to access the other side. Directions sorted (who said that Men can’t ask for directions?! ), we found a nice site, set ourselves up and had some dinner before an early night in bed. A beautiful afternoon despite the showers – our new Ultimate friends in the corner! While we were still in bed the next morning, the people in the site next to us left, so we decided to put Trent and Leanne into that site and spread ourselves out a little bit, hoping that the campground wouldn’t get too crowded over the long weekend. Before long, they arrived with their brand new Modcon FF1 camper in tow. 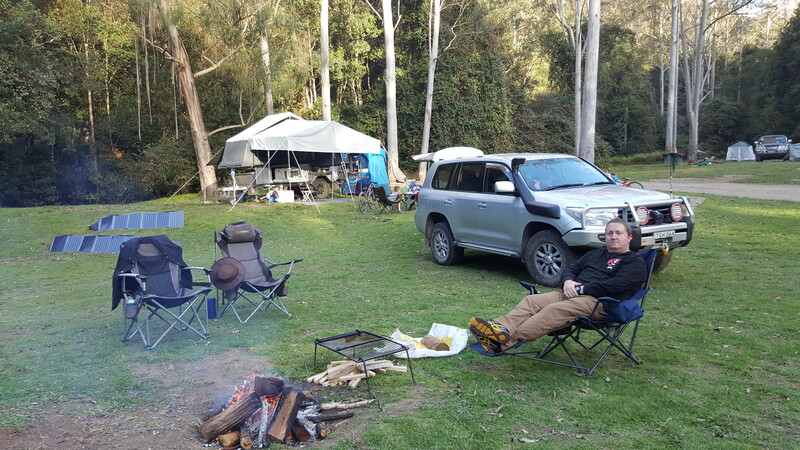 After hiring a variety of Cub campers for the last year or so, Trent had finally had enough and decided it was time to take the plunge on a camper that suited their family. Much entertainment was had while we watched them set up for the first time and offered some helpful advice – it was the least we could do! It wasn’t long though before they were set up and we had a nice relaxing afternoon, testing the waterproofing of their awning during some scattered showers. Trent and Leanne’s new setup. Nice camper! Friday was also a very lazy and relaxing day before we decided to head into Dungog to have a look around and stock up on a few supplies. 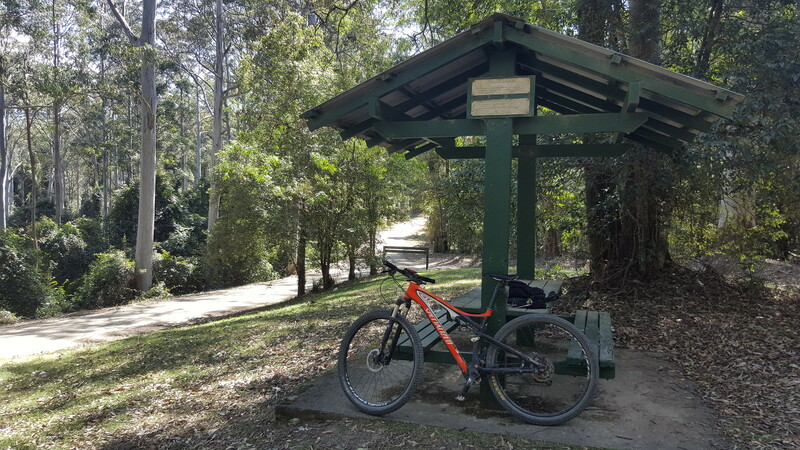 As our whole family is doing the Great Cycle Challenge during October to raise money to fight kids’ cancer, I decided to hop on the bike and ride into Dungog. It seemed like a good idea at the time, however the left turn out of the campsite was followed by a nasty climb of about 250m – some warmup! 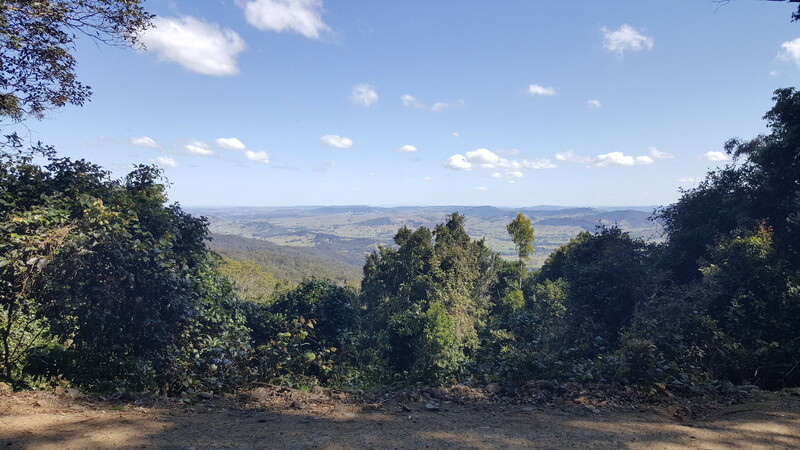 The upside was that following that it was then nearly all downhill from the peak of about 560m above sea level, down into Dungog at less than 100. Coming back from Dungog I put the bike on the roof of the car (yes, cheating – I know) up to the top of the hill, and then rode the descent back to camp. Unfortunately our new “Ultimate” friends Peter and Elysha and their 2 boys had decided on a quick pack up and headed off while we were away after one of “those” campers decided to set up pretty much on top of them. Great to meet you guys, and I’m sure we’ll bump into each other sometime again. And thanks for the firewood! We had a Garmin on Lucas‘ bike for the duration of the trip and he managed to clock up about 60km over the course of the week, nearly all just riding around the campsite. Ella ended up with about 30km and Rach reached the grand total of 8km. I went for another ride on Tuesday afternoon after the others left, and it was such a beautiful ride. This time turning right out of the campsite, but being prepared for the even bigger climb I just sat up and enjoyed riding, not trying to go to fast but to enjoy the amazing surroundings. I stopped here for a while. There was phone reception to check in on how things were going at work. Gorgeous views on my ride. I had to stop a few times to really appreciate it. Sunday was an absolutely cracking day. The whole campsite had filled up significantly with plenty of “those” campers, although fortunately none of them were on top of us – probably thanks to how much we had spread everything out! 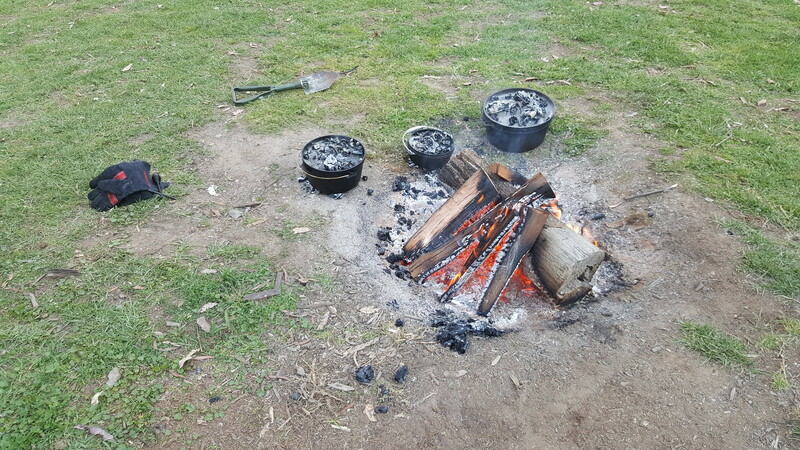 I got the fire started early so that we could have a nice lamb curry for dinner and we spent the day relaxing – the kids on their bikes for most of it! This needed close supervision – yes, ALL day! 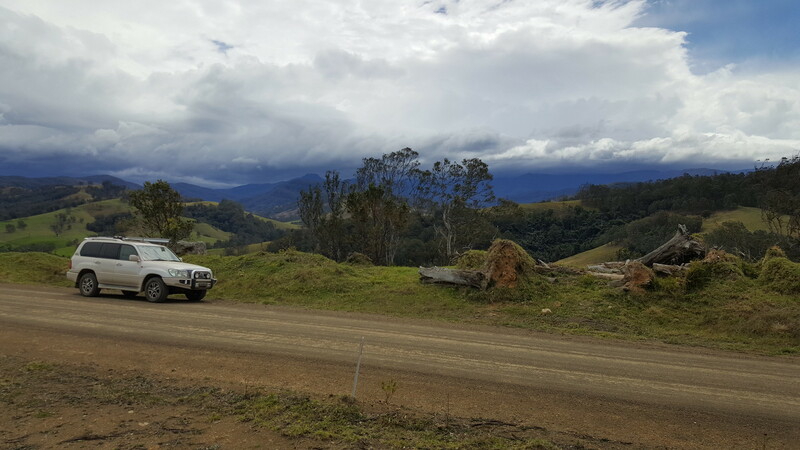 Being so close to the Barrington Tops, the plan for Monday was to get in the car and go for a bit of an explore. However the further we got into the tops, the more evil the weather became. With some serious wind already bringing down some trees that were partially blocking the tracks, we decided to cut short the explore and come back another friendlier day – there’s some unfinished business here. 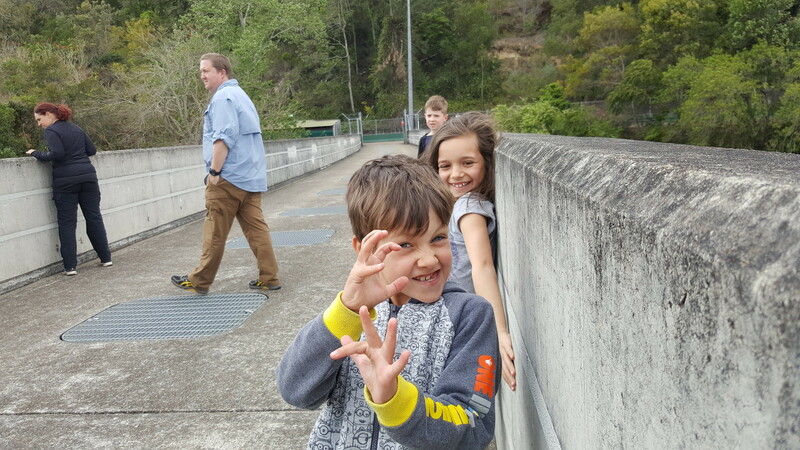 On the way back to camp we checked out Chichester Dam – you’ll be able to see from some of these photos how windy it was! Magnificent location, but you can see the anger in the skies in the distance. What you can’t see is the wind – it was hard to stand up to take the photo! Tuesday we said goodbye to Trent, Leanne and the boys after offering just as much useful advice during their first proper pack up of the camper. I had a ride as I mentioned earlier and Rach and the kids did a little bit of riding around the (now quiet) campsite. There was discussion of packing up and heading home, as the wind was starting to get to us all, including the hot water system on the camper, which refused to stay lit in all but the most still conditions. It seemed like it would go out if anyone so much as farted in the general direction of the vent – I might need to research whether this is a common problem and whether I can make up some kind of shroud to protect the vent from some wind. Regardless, we had a great time and found 7 nights in one location just what we needed to relax. It was great to hang out with Trent, Leanne and the boys again – looking forward to the next trip.